Does Our First Principle Go Far Enough? I am about to go to our veterinary clinic and pick up our 12-year old dog, who yesterday had her spleen removed because of a growth that seemed suspicious. She also has been diagnosed with Cushing’s Disease and so will be treated for that once her incision heals. We thought nothing of taking her for an ultrasound when she seemed to be lethargic and when she began having ‘accidents’ on the rug – although it seemed quite deliberate to me, not accidentally! We lost her sister to bladder cancer earlier this summer, and were so afraid that she might have the same condition. We didn’t hesitate to follow the recommendations of our vet about surgery and treatment. So, we are hoping that soon she will be back to her perky, funny self. For many of us, we treat our pets like members of our family…because they are. Other cultures do not give dogs or cats the same free reign of the household; in Senegal, on a student trip several years ago, I saw carcasses of dead dogs on the side of the road that would never be collected, because it was forbidden to touch them. 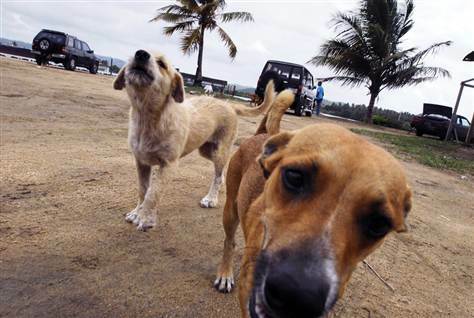 In Puerto Rico, there is a beach where dogs are abandoned and discarded, alive and dead, because people do not want to care for them and have not neutered their own dogs to prevent litters of unwanted puppies. I have had conversations this fall with congregants in emotional agony because they are separated from their pets while hospitalized, or because they have to make decisions about their pet’s treatment in the face of possible terminal conditions. And I have heard stories about how, when, in the past, church members have shared during Joys and Sorrows their sorrow over losing a pet, they have been ridiculed for doing so by other members. 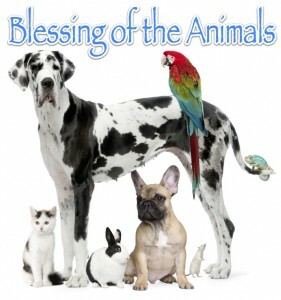 Next month we will be having a Sunday morning Blessing of the Animals. I understand that some people just don’t have pets; others can’t because of allergies, and for them, this is not a service they will care to attend. But for so many of us, the furry family members we will bring to the service (on leashes, along with scaly and feathery creatures in cages) add value to living. We are fascinated with them, we spend hours looking at them, playing with them, grooming them, not because they reflect anything about us, but because they are so different from us. They make us aware that we are only one species; and that we have a responsibility to respect and care for the other members of the animal kingdom. We are most keenly aware of this when we see the headlines about Cecil the lion being killed for sport, or the most recent local headline about Moxie, the beautiful puppy who was found beaten and buried, barely alive, not so far from this church. He is surviving, possibly against all the odds; he may not recover fully because of the head trauma he suffered; but the loving treatment he has received from the veterinary clinic that took him in has made the news locally and nationally. “If you have men who will exclude any of God's creatures from the shelter of compassion and pity, you will have men who deal likewise with their fellow men. St. Francis has become the patron saint of animals and many in the animal rights movement try to emulate his care and concern for Creation. Many Unitarian Universalists take this to mean that our First Principle, by which we affirm and promote the inherent worth and dignity of each person, should be amended to read “the inherent worth and dignity of every being”. I recommend that you go to the First Principle Project website and read more about this proposal: http://firstprincipleproject.blogspot.com/p/faq.html . I’d be interested in your thoughts and reflections. And I’ll see you – and your non-human family members – in our Sanctuary on October 25th! The water that our staff found on the kitchen floor the morning after the storm was quite obviously from the rain that had pooled up and had come in under the door. They mopped it up, pulled the mat out to dry, and talked once more about the drainage problem at the entrance. When water was standing again the next morning, after a dry night, the assumptions the staff members made had obviously been wrong. They looked more closely and saw a big water stain on the side of the cabinet next to the dishwasher…and once that appliance was pulled out, a slow leak was found that only required a half-turn to stop. Their attention had been misdirected because of the storm. Last week our great-grandson began to run a fever, off and on. By the third day it had broken, and a new tooth had appeared on his bottom right gum! We put it down to teething troubles…until the next afternoon, when we took off his shirt and found a red rash across his back. The next morning it was all over him; with the help of WebMD, our diagnosis was roseola, a virus that babies contract that results in a body rash after a fever. We were misdirected by the new tooth. I mention these two examples because of the tendency we have as human beings to jump to conclusions. Many times, that wrong conclusion is because we have put two and two together and made three! These two things have made me more aware of my need to think more carefully and consider things more broadly before I come to a conclusion. When we have a conflict with someone, whether it’s an open disagreement or quiet resentment over something they’ve done, quite often, if we retrace the path of its escalation, we can find the moment where we jumped to a conclusion, or were misdirected by the seeming congruence of factors. Giving the benefit of the doubt, instead of thinking the worst, might be a skill we can resolve to work on this week. This past Sunday I conducted our Children and Youth RE Children’s Chapel, which is basically a service that takes place in our Common Room while the grownups are in the Sanctuary. 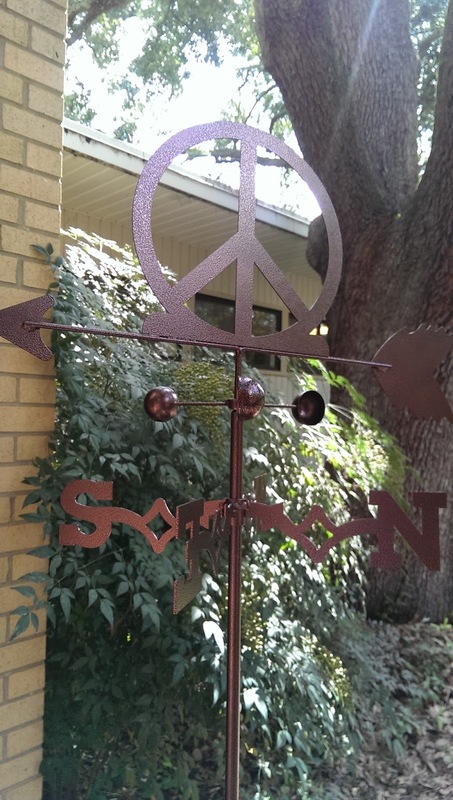 I was excited because I purchased a new peace sign weathervane to help us during services where we call the directions; many of us, with our cellphone compass apps, may think we don’t need any help finding North, but it is a visual symbol that together we are addressing the directions. I will be using it this coming Sunday for our Ingathering and Water Communion service, but I wanted to first use it with the children. It really worked well, and the service got underway with little problem. The theme for the service was the Four Elements that make up the power of life; the curriculum of Sing to the Power has been completed and this was the service to tie it all together. We had a nice discussion among the children about Earth power and how they feel connection with the Earth. We also talked about how we are sustained by the food we grow on the planet, and how the members of our church do service work that connects with the theme of "earth power"-for example, our food pantry and the local soup kitchen. Next we discussed air; the four characteristics are Stillness, Presence, Silence, and Listening. We had a volunteer model stillness (for about 3 seconds! ), and then we talked about why it’s important to listen. They seemed interested when we talked about the ministry of presence that our pastoral care team practices, such as visiting people in hospitals; some of the children had been in the hospital before and knew how lonely it could be and how nice it was to have someone to listen to them talk about their experience. Fire was the next element, and we discussed their passions (video games and sports), and how people don’t just have a passion for something they act on it. They gave examples of how people stand up for justice, such as groups working on protection of the environment or animals. Our final element was water, and we talked about the power of water that makes smooth stones. We discussed Hurricane Katrina and how water, and all the elements, can be dangerous or helpful. When we extinguished the Chalice, I knew they were still listening because when I read the quote below from Chief Seattle, one of the boys reacted to the second line, “The earth does not belong to us,” saying “Huh?” Then he heard the next line: “we belong to the earth,” and nodded his head. The final thing I did was to introduce the special guest who’d been sitting patiently in a chair next to me during the entire service. Poppy the Peace Monkey is my new office buddy, she sits in here and gives hugs to whoever needs one. Because she has so many peace symbols all over her fur, she is named after the flower that is associated with peace, as it is the only flower that grew on the battlefields of Europe after they were ravaged during World War I.
Poppy got lots of hugs from the children. 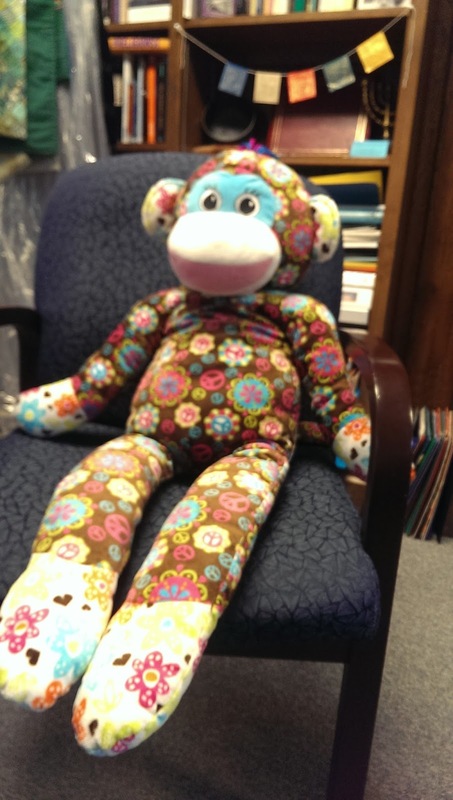 We began the service with the peace weathervane and ended with the peace monkey; so nice to think our children experienced an hour in a little oasis of peace in a troubled world.